Giving Godzilla a son sounds like a good idea on paper. Other movie monsters have had progeny: King Kong (a son), Dracula (a son and a daughter) and even Frankenstein (okay, so technically it was the doctor’s son). So why not Godzilla? Why not, indeed? There’s some impressive kaiju action in Son of Godzilla. Both the giant mantises (Kamakiras) and the giant spider (Kumonga) are well-realized through elaborate puppets. But they weren’t expected to be cute. 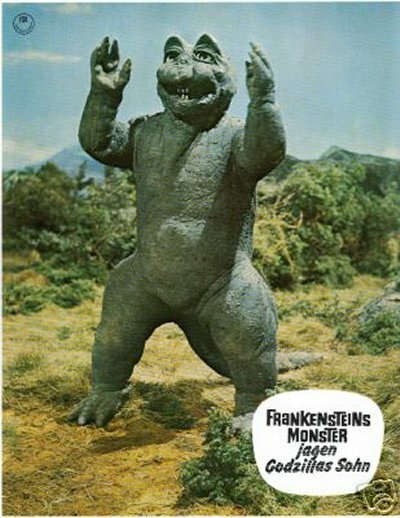 It’s obvious that Minya (aka Minilla**) is meant to elicit “awwwww” rather than awe. He has huge eyes and a baby “roar.” Instead of breathing atomic fire like dear old dad, he blows smoke rings. And it might have worked had he not been so poorly realized. He’s got a pudgy, humanoid body and a stubby tail, looking less like the Prince of the Monsters than a deformed midget. And his baby cry sounds like that of a particularly irritating duck. He showed up in the next couple of Godzilla films, Destroy All Monsters and Godzilla’s Revenge. In the latter–which occurred largely within a child’s imagination–Minya gained the ability to talk, and it was every bit as tragic as you might expect. His final appearance to date was in the monster mash Godzilla Final Wars. Whenever I watch Destroy All Monsters–in which aliens take control of Earth’s monsters and set them against the cities of the world–I ponder the same question. If Godzilla nuked New York, Rodan mashed Moscow and Gorosaurus pummeled Paris, what metropolis suffered the wrath of Minya***? *There’s a Godzilla Jr. in the ’90s films that starts off human-sized and–over the course of three films–eventually grows into a replacement for the Big G after the latter is killed by Destoroyah. He’s never explicitly referred to as Minya, but like Godzilla’s previous “son,” he comes from a mysterious egg. In neither case is true parentage established. **However, he is not called “Godzooky.” That’s Godzilla’s flying “nephew” from the Hanna-Barbara cartoon series.